Sorry, it’s been awhile since my last post. Life has been getting in the way of blogging lately. I just got back from visiting my hometown, where I got to spend some time with my parents and see some old friends. I also took the time to clear out and update my old room in my parents’ house—corsages from high school dances were finally thrown out (among other things) and a fresh coat of white paint now covers the pink stripes that I used to love on my bedroom walls. It’s been almost 7 years since I left for college, but going through all my old things and saying goodbye to the pink striped bedroom of my childhood has left me in a haze of nostalgia. On top of it all, I also went wedding dress shopping with one of my best friends, who is now engaged to her high school sweetheart, and all I can think is: When did this happen… When did we become adults? Time seems to be flying by at warp speed these days and there never seems to be enough of it to go around. That being said, it looks like the month of July isn’t going to be a big baking and blogging month for me; and not just because I’ve been sitting around pondering my adulthood. Now that I’m back in Houston, I’m getting ready to leave yet again–this time on a weeklong road trip through Texas with Andrew and the dogs. So it looks like my kitchen will be neglected for a bit longer. 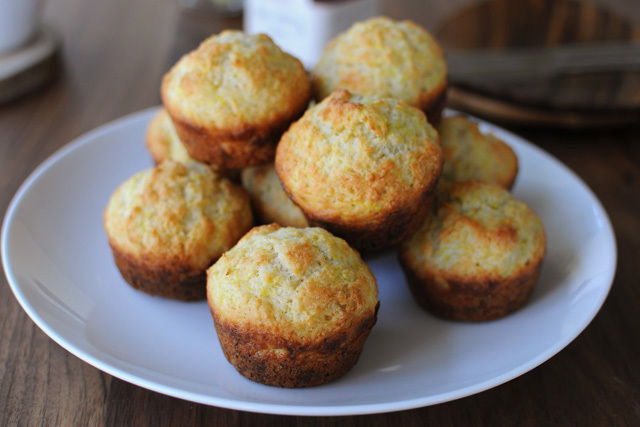 For now though, I do have these Lemon Summer Squash Muffins to share with you. We have been getting summer squash in our local produce box every week and Andrew has declared that he is “squashed out” (i.e. he can’t eat anymore squash), so some baking was in order. 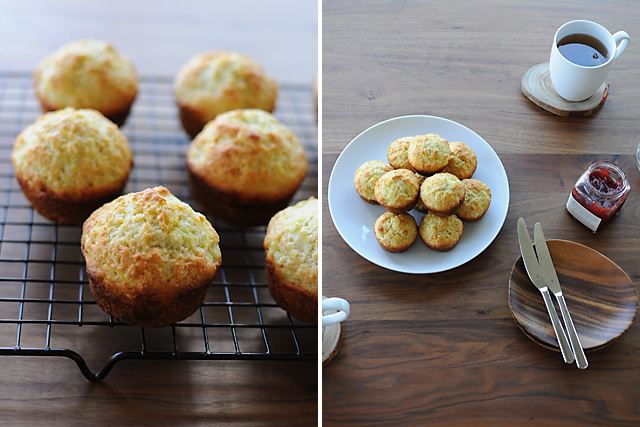 The batter for these muffins is filled with shreds of yellow summer squash and grated lemon zest. When baked, the flecks of yellow throughout the muffins remind you of what’s in them, even though you can’t tell what’s squash and what’s lemon. Heat the oven to 400 degrees and grease a muffin tin or line with paper liners. In a large bowl, whisk together the flour, sugar, baking powder, salt, and lemon zest. In a small bowl or glass measuring cup, whisk together the eggs, yogurt, and sunflower oil. Add the wet ingredients to the dry ingredients and gently stir with a rubber spatula until almost combined—the batter will be very thick. Then fold in the shredded summer squash. Using an ice cream scoop or a 1/4 cup measuring cup, portion the dough into the muffin tin. Bake for 20 to 25 minutes, or until the muffins are lightly golden and spring back when touched. Cool for 5 minutes in the pan before turning them out on a wire rack. Serve warm or at room temperature with a slathering of butter and/or your favorite jam. These little muffins look lovely – anything with yoghurt in is always so beautifully moist with the perfect texture. I have still yet to clear out my old room at Mum & Dad’s but I suspect the time will come when I visit at Christmas. I expect I’ll also wonder where the time has gone. Glad to hear you and Andrew are heading out and about! It is always fun traveling with pooches! Love these squash muffins, and especially the fact that you can freeze them. They would make a perfect take to work lunch! I’ve been scouring the internet and this is the only recipe for summer squash muffins I could find that didn’t require more sugar than squash. Thank you so much!! And they look gorgeous too! I will be trying these muffins asap.